As much as I enjoy trying new products, nothing beats having reliable favorites that are also a pleasure to use. The above are products that I come back to time and time again, and right now, each one is being used in my morning routine. After many attempts at finding the perfect facial cleansing oil, I finally settled on Laventine’s just over two years ago. Its high quality, natural ingredients, subtle but lovely aroma, and exceptional efficacy made it the clear winner. I use it every morning when only a gentle cleansing is needed and oftentimes at night to wash away makeup prior to a foaming cleanser. Laventine allows for a wonderful facial massage which aids in its purifying action. I remember reading a post over at IndiePerfumes that delved into the benefits of Ayurvedic facial massage. I’ve never done the full massage described in that post, but I do a mini one quite often which is relaxing and restorative. After cleansing with the oil, I pat my face with a towel very gently so my skin still feels hydrated from rinsing. I then warm up a large pea-sized amount of Dr. Hauschka Quince Day Cream in my hands and apply it all over my face, making sure it’s most liberally applied under my eyes. I mentioned this moisturizer in my “favorites list” last spring, and still feel the same way. Even though it feels lightweight, it hydrates like a cream and its effects last all day. It’s now time to swirl my EcoTools Bamboo Finishing Kabuki around the pan of my Jane Iredale PurePressed Base and then spritz it with some evanhealy Rose Geranium Hydrosol which imparts a slightly dewy finish to the mineral powder. Applying the powder with the EcoTools Kabuki is unbelievably soft and gives moderate coverage since its fibers are not too dense. This makes it really easy to blend, and also build coverage if you prefer more. A few other pluses about this brush are its price point ($7), it doesn’t shed, and it holds up well after cleaning. As for the PurePressed base, I can’t say enough good things about that either. It has an SPF of 20, a very natural look and does an excellent job at covering up “spots” -say it with a British accent like Lisa Eldridge– as well as dark circles. That’s why I concentrate the Quince Day Cream under my eyes as I apply a good amount of PurePressed Base atop my often visible dark circles with the EcoTools kabuki. In the photo, you’ll see a smaller brush below the kabuki, and that’s my Giorgio Armani Blender Brush. I adore its shape, soft bristles and its ability to blend foundation in hard to reach areas, like the eyes. After all that, which just takes a couple minutes, the variety begins. It might be simply an eyeliner, mascara and lip balm day, or possibly more with eyeshadow, blush and lipstick added. Either way, I’m set for the day. Visit The Non Blonde for a full review of the Giorgio Armani Blender Brush. evanhealy Rose Geranium Hydrosol $23.50 for 4oz. Disclosure: I purchased all of these items. This post does contain affiliate links. All opinions are my own. My routine is as simple as your routine. I use Alima minerals instead and Boscia for cleansing oil. Love them both. That was so nice to read! I love your simple routine, and the products you use sound lovely…so lovely I my need to try them! If you don’t mind my asking, what foaming cleanser do you use? Laughing at “spots”…I actually said it out loud in a British accent right after reading that 🙂 I love Lisa’s videos! I just love how she says “spots,” it makes blemishes sound so benign! Her videos are fantastic, my fave tutorials by far. As for a foaming cleanser, I like Daybreak Lavender Farms Almond Cream Soap. It’s a bar soap and it comes in a big bar that I slice up as I need it. Also, Dain over at ARS Aromatica did a very thorough review of their products a few years ago. Out of the ones she reviews, the Almond Cream Soap and the Rhassoul soap are the ones I use and like the best. I also like John Masters Rose Foaming Wash, but it foams just a little. I forgot to mention nah-la’s geranium sap cleanser. It lathers up amazingly, I love that stuff! Does the Laventine leave a residue on your face? I feel like with cleansing oils, they never quite rinse off all the way for me. After I rinse with warm water and pat dry, my skin just feels soft, no residue. But my skin is a little dry so maybe it just soaks it right up? So sorry for the late reply! 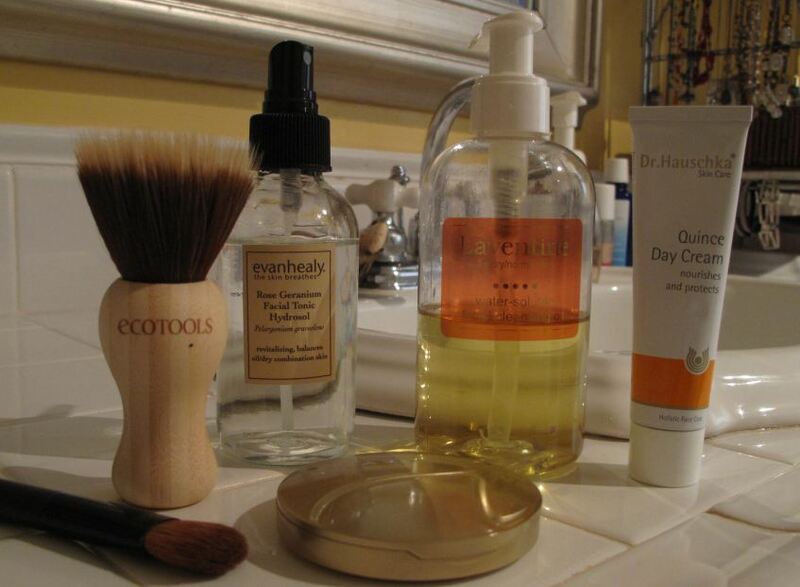 Thanks so much for your comment and you gotta check out the EcoTools Kabuki, it’s wonderful! I also enjoy Dr. Hauschka and Jane Iredale products very very much.